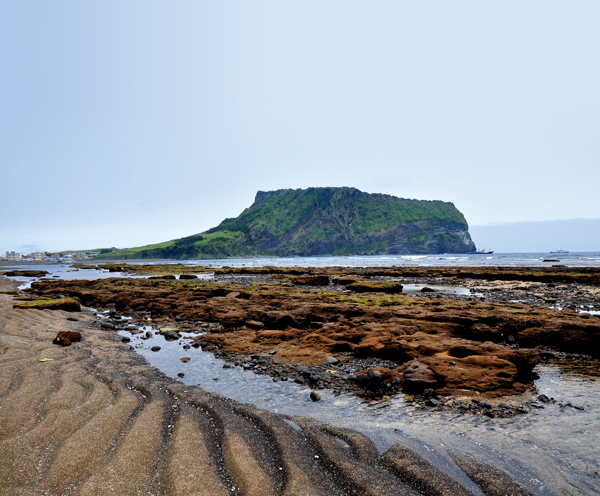 At the beginning of October, 2010, the Global Geoparks Network announced that Jeju Island would be made its 20th member, making it Korea’s only province to be assigned Geopark status. In the categories of geology, archaeology, biology and cultural interest, nine sites on the island were inspected and later certified. This article introduces the second site: Seongsan Sunrise Peak — Ed. Somewhere between 40,000 and 120,000 years ago there was a sub-sea eruption on the shallow sea bed. This eruption was explosive and the magma very viscous. The violent interaction between hot magma and cold sea water formed a distinctive Surtseyan-type volcano. Subsequent exposure to the sea eroded its sharply rising sides, except on the side facing the island. 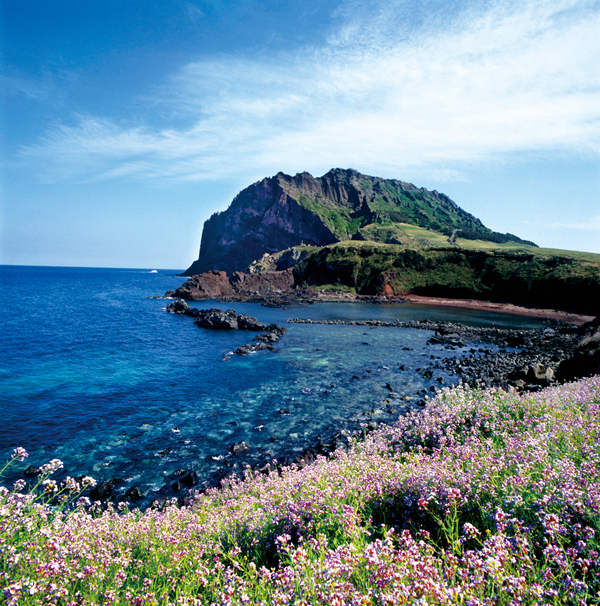 Though it used to be an islet, a small reef now connects it to Jeju. Hydromagmatic volcanos can be classified by height, crater size, and angle of the slopes. They are either tuff rings or tuff cones. A tuff cone is smaller and steeper than a tuff ring. Seongsan is a tuff cone composed of thin layers of fine volcanic fragments and ash, with a deep, wide crater. It is a scientific marvel as its geologic features are readily accessible and well preserved. “I think Ilchulbong is one of the most promising sites in the world to get a groundbreaking discovery in hydro-volcanism, volcanogenic sedimentation, and in volcanology in general,” said Prof. Sohn Young Kwan, one of the first scientists to conduct a detailed study of the Seongsan tuff cone. In a 1992 paper published in the journal Sedimentology, Prof. Sohn’s work from the late 1980s and early 1990s revealed traits which could guide studies of subaqueous to emergent volcanoes around the world. In an email interview with The Jeju Weekly, Prof. Sohn, who is a Doctor of Science in the Dept. of Earth & Environmental Sciences of Gyeongsang National University, explained that new observations at Seongsan by Korean and New Zealand volcanologists have revealed some very interesting discoveries over the last few years. He said their study was presented last December at the American Geophysical Union Fall Meeting in San Francisco and will appear in the journal Geological Society of America Bulletin this year. “The Jeju government launches research projects on these sites from time to time. These projects are not always scientific, however, but related more to development and promotion of the sites,” said Prof. Sohn. However, he stressed that scientific research will continue to be conducted by individual researchers like himself, with support from the Korea Research Foundation and funded by the Ministry of Education, Science and Technology. “Basaltic volcanoes like Ilchulbong provide high-resolution information of magmatic processes operating over periods of hours to weeks deep within the mantle of the Earth. Often overlooked in these volcanoes are subtle indicators of eruption breaks, which occur as erosion surfaces or unconformities within volcanic strata,” explained Prof. Sohn. In 2000 it was designated a Natural Monument, which is significant because this halted any further damage from tourists and farmers. According to the Cultural Properties Protection Act, “unauthorized change of the original states of a cultural property and natural monuments is not allowed.” Moreover, the landscape around natural monuments is also protected. In the last century, the crater was used by farmers as a field to grow bamboo. Seongsan is known as Castle Mount because of its shape. Also, according to folklore, the “99 stones” around the crater lip make it look like a crown. It is a site that has been beloved by Koreans for thousands of years. Ilchulbong means “sunrise peak” and it is very popular with reverent locals and tourists who mark the first sunrise of the New Year with Seongsan majestically cupping the new sun with its wide crater. Normally there are Shamanistic rituals, poetry recitations, performances, a night hike, and fireworks. This year, however, the 18th Seongsan Ilchulbong Festival was canceled on Dec. 25 due to fears of spreading foot-and-mouth disease. Tourists come for the hiking, horseback riding, and stunning sunrises and sunsets. It’s just as popular with non-Korean tourists, too. A quick look at tripadvisor.com shows Seongsan Ilchulbong has a nearly perfect score in 26 reviews by Americans, Singaporeans, Indonesians, Japanese and others. Main complaints are the bus loads of tourists, but overall visitors agree that it is a must-see destination. Next to Seongsan Ilchulbong there is a small fishing community which also caters to tourists with shopping, restaurants and accommodation.